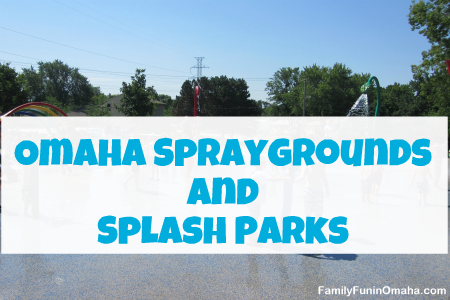 Splash around at 20+ Fun and Free Spraygrounds and Splash Parks in the Omaha Area to stay cool on a hot summer day! 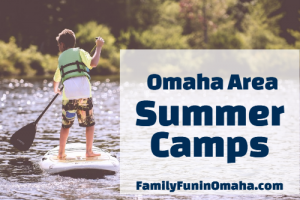 Discover many more FREE Summer Activities in Omaha including concerts, indoor and outdoor movies, fishing events, hydrant parties, and more! Hours are 9:00 a.m. to 8:00 p.m. daily, May 27th through Labor Day, weather permitting. Benson Park, 7002 Military Ave.
Fontenelle Park Sprayground, 4405 Fontenelle Blvd. Kountze Sprayground, 1920 Pinkney St.
Morton Park Sprayground, 5724 S. 41st St.
Orchard Park Sprayground, 6502 Hartman Ave.
Seymour Smith ALLPLAY Park, 6802 Harrison St.
Upland Sprayground, 3104 Jefferson St.
Westwood Heights Sprayground, 12334 Seldin Dr. The splash pads are open Memorial Day through Labor Day. Eagle Ridge Splash Pad – 2 blocks east of 66th St. and Ashwood Ave. in the Eagle Ridge subdivision. 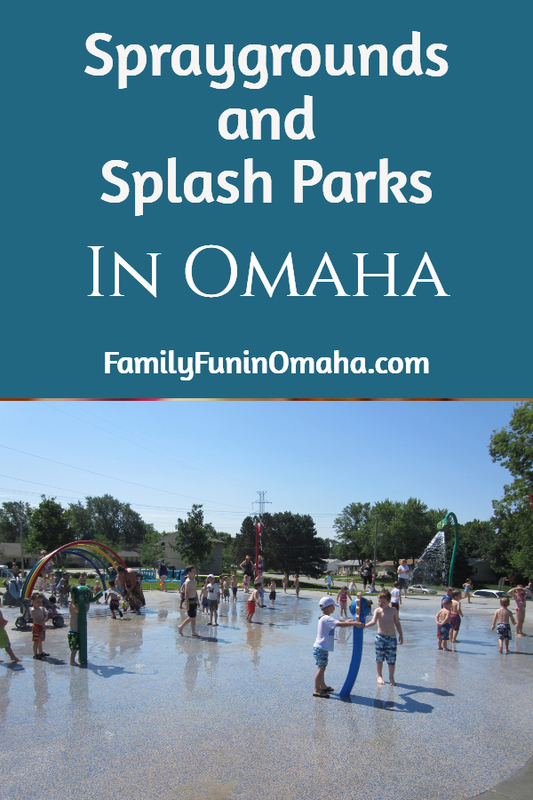 The splash pad is open from 10 a.m. to 7 p.m.
Schwer Park Splash Pad – 800 W. Centennial Rd. The splash pad is open from noon to 7 p.m.
First Street Plaza Splash Pad – This is a small water feature located on the corner of First and Washington Streets in downtown Papillion. It is open from 9 a.m. to 10 p.m. The spray ground is generally open every day from Memorial Day Weekend through Labor Day Weekend, but will not be available during special events. Fun little water fountains provide big entertainment. Small outdoor water play area that is typically open from Memorial Day to Labor Day. 4655 N. 163rd St., Omaha. In the neighborhood off 108th and Harrison. 7419 S. 101st Ave, La Vista, NE. Located at 12th and Redick. Water playground, plaza, trail, and picnic areas. The is a small interactive water component incorporated into the north side of the plaza. This is a small 12′ diameter area with child activated sprays that emanate from the plaza floor. These water features will be located near River’s Edge Pavilion, throughout the grove and next to the Plaza, which will include an interactive 10-foot tall water wall, a flooding wading basin, water bubblers, spray jets and an illuminated fog feature, the first of its kind in the metro area. Located on the Council Bluffs side of the Bob Kerrey Pedestrian Bridge. Grand Opening Friday, May 25th, at Loessfest! 6th and Vine Streets. Open 10 a.m. – 8 p.m. daily from Memorial Day through September. Hours are 8 a.m. – 9 p.m. daily. All Splash Pads open on Memorial Day through Labor Day. Ronin Park – 17th and Somers Ave. The Alaskan Adventure Splash Pad offers an excellent way for Zoo visitors to cool off during a hot Summer day. Be sure to bring a change of clothes. 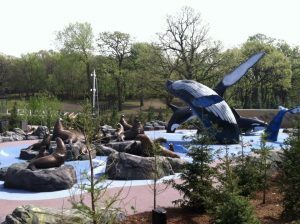 This is included with admission to the Zoo, and is located near the North entrance. A state-of-the-art two-tiered splash pad and squirt gun center is designed for use by preschoolers all the way up to teens. Admission: $3/person; Children 2 and under are free. Hours – 1 to 7 p.m. (according to website). Daily or annual State Park permit required. 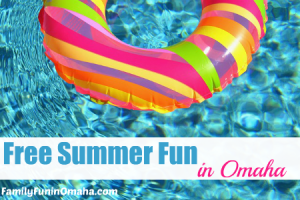 Have a splashy fun summer!